I cannot believe that my last post was in December and now January is almost over. 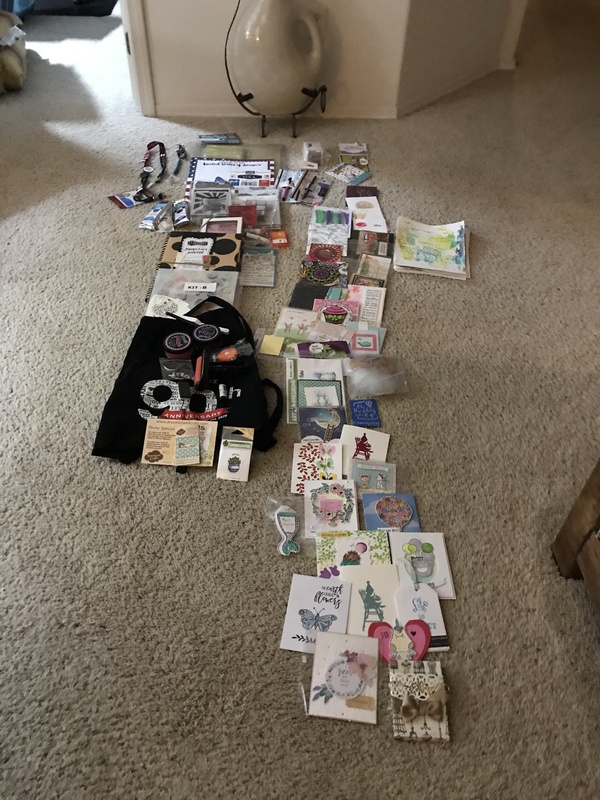 I did not get anything posted on this blog, but I did have a busy January. Taking Christmas decorations down and packing to leave for Arizona seemed to take more time than usual even though I didn’t have as tight a schedule as last year. Creativation was on here seemingly before I got a chance to unpack. Had an unbelievably fun week with most of my pals from Scrapendipity. On Thursday and Friday, we were all busy with classes, which were without exception simply wonderful. It is really a special treat to see crafting celebrities in person and to watch them work in class. Included were classes from Altenew, Lawn Fawn, Gel Press, Dyan Reavely and Faber Castell. Then on Saturday, Sunday and Monday we drooled over all the new products coming out. Sandra flitted from booth to booth, sitting down to make dozens of Make and Take projects. It was all I could do to keep up with her. We hung around the Ranger booth, learning about the new alcohol inks and Oxide sprays from Tim Holtz. We were clearly visible in our Canadian buffalo plaid shirts in several of the different companies’ videos being made of Tim’s demonstration. Shameless, we were. Here is a photo of some of the loot we received in the classes and some of the Make and Takes we did. 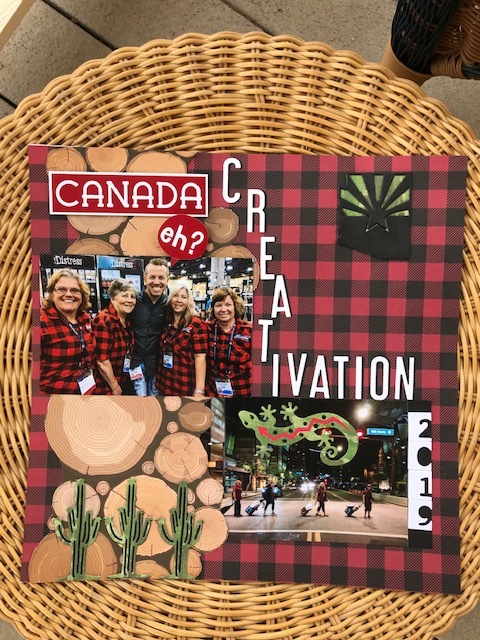 I have so many things to do, I thought I would skip this week’s Make it Monday Challenge at Papertrey Ink, but when I saw the topic was photo ornaments, I had to participate. 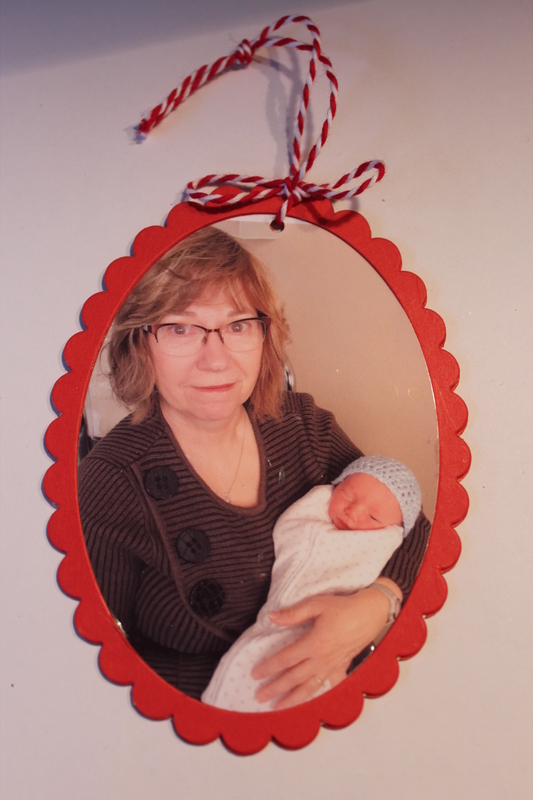 I have a brand new grandson to show off ( November 15), so of course, he had to go on the photo ornament. The ornament is nothing special, but this little guy is the star of the show. I am thinking now that I need to go back through my photos and pick out a baby photo for each grandbaby and make an ornament for each. The most difficult part is finding photos that will fit within the frames that I have. 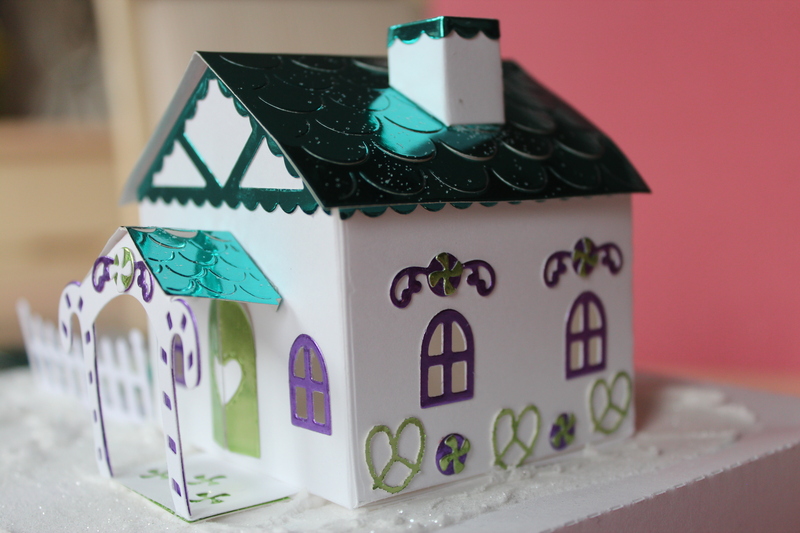 Today, I used the scalloped oval die from Shakers and Sprinkles, but next time I will try using the Shaker Tree die if I can find photos that will work. Just so you know…………….that is not baby spit up on my sweater. I was in such a hurry to get to the hospital, I slopped toothpaste all over myself. I dabbed it off, but unbeknownst to me, it dried back all white and gross looking again. All I can say is OMG! 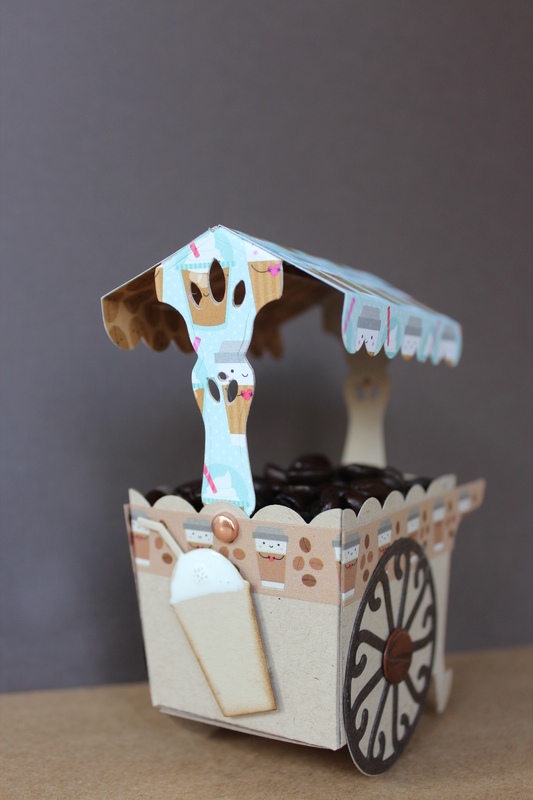 This little project is the epitome of summer and coffee. It was easy to make thanks to Papertrey Ink’s Market Street kit, and the paper and washi tape from Doodlebug was a match made in heaven. 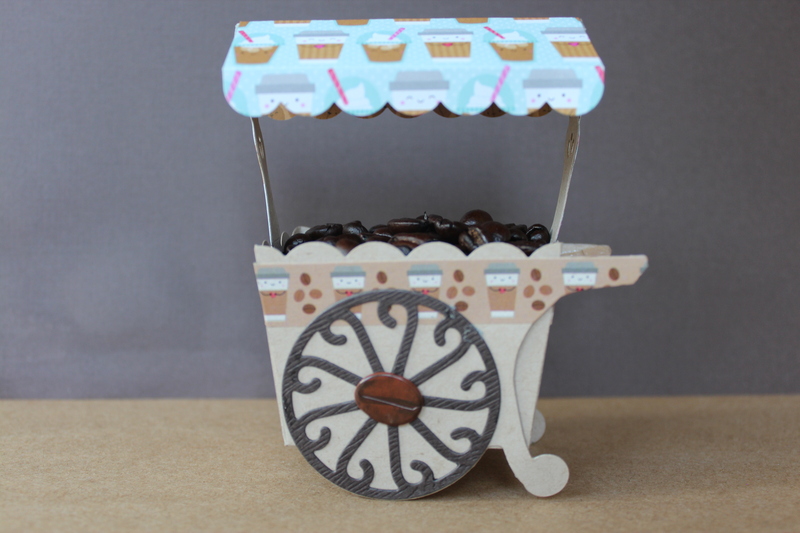 The icing on the cake is the coffee bean hubcaps on the cart, that are from Eyelet Outlet. I filled the cart with loose coffee beans for the picture, but this would be a great gift filled with a couple of Tassimo or Keurig cups as well. This is my second post today as it is just too dang cute to wait until tomorrow. 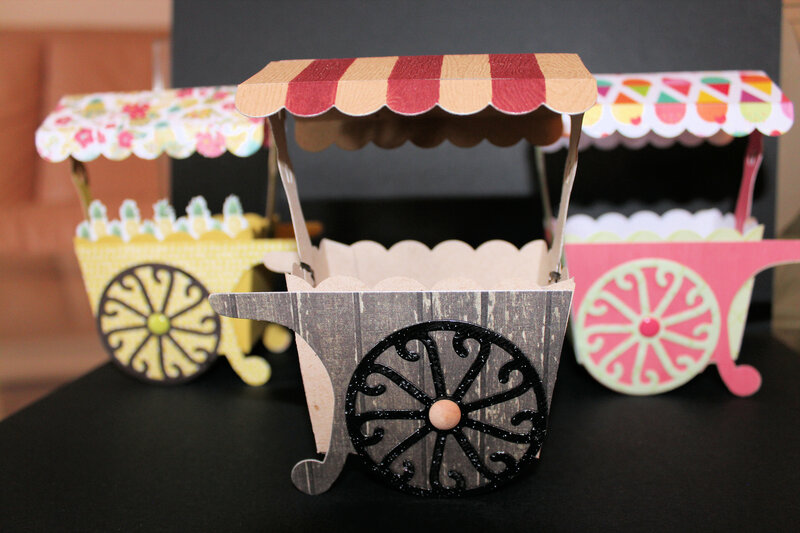 Today I put together three different carts from Papertrey Ink’s Make it Market, Market Street kit. I started with the brown woodgrain looking one, as I want to make a layout of my upcoming visit to Dublin, featuring the statue of Molly Malone selling/singing, “selling cockles and mussels alive, alive oh”. You might wonder at my fascination with this song/theme/image, and even if you never wondered at all, I am going to tell you about it. I heard this little ditti as a child, as my tone deaf mother (and she sounds like Adele compared to me) would sing it while doing housework. The problem was that as a landlocked little girl growing up in Saskatchewan, I had never heard of “Cockles and Mussels” and it all sounded bizarre and somewhat perverted to me. The memory stuck with me for many years, until I was finally enlightened about cockles and mussels. The lovely lady is pictured above. The picture is from Wikipedia Malone 073007. First picture is my Molly Malone cart followed by the Fresh Pineapple and Ice Cream cart samples. I may try to make some little baskets like in the statue picture when I make a flat version of the cart for the scrapbook layout. Today I was thinking that I must try to fit in an entry to the Coffee Lovers Winter Bloghop in spite of being busy preparing for Christmas when I realized that I made something today that is not only a gift I am giving but also a perfect entry into the bloghop! Duh! The instructions came through my friend Jen, from Stampin Up Canada. 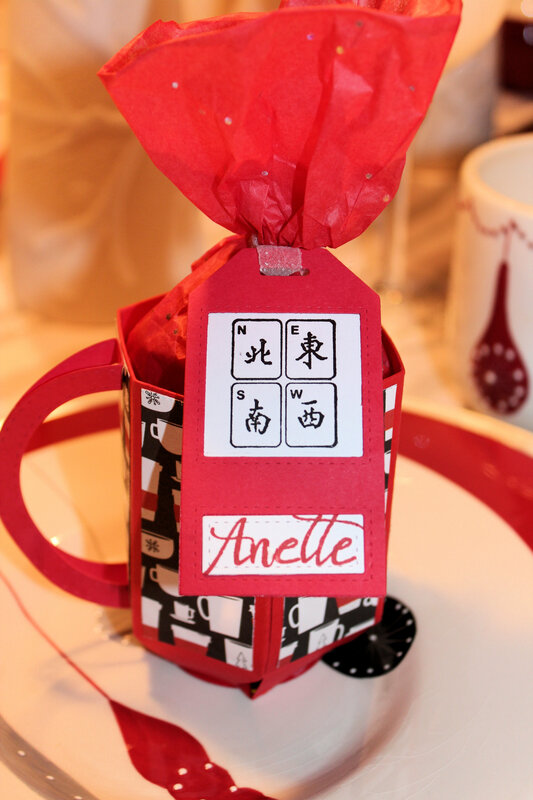 This gift is for a year end party of my Mahjong Club, thus the Mahjong tiles on the tag. What? doesn’t every one have a Mahjong tile stamp?? 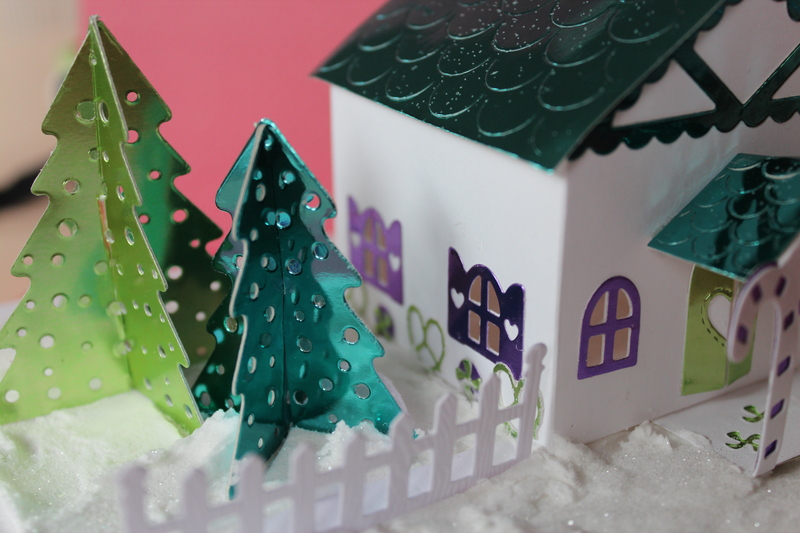 Today is the day to post the finished project for Papertrey Ink’s November Blog Hop. My fingers are all limbered up from the crazy number of Black Friday bargains that I have put into a cart. I even followed through and ordered some of the things that I put in the cart. The horrible current exchange rate caused me to abandon several other potential purchases though. 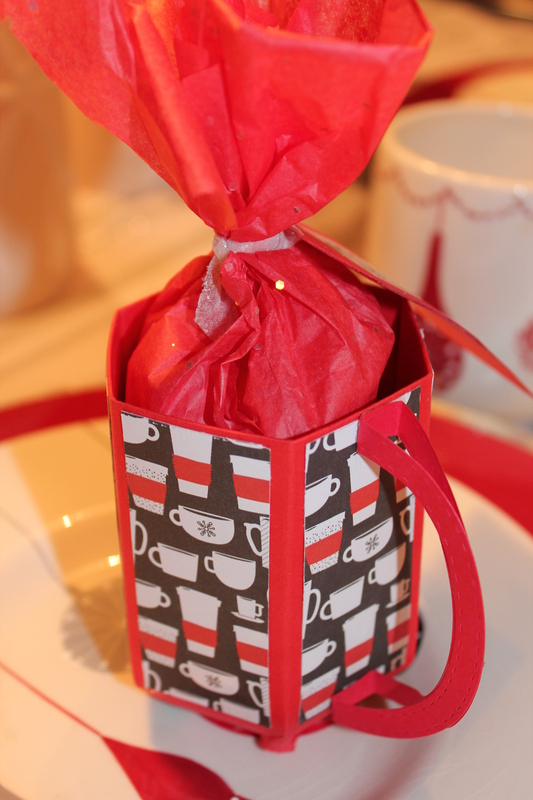 I am back with more tags to enter in the 25 days of Christmas Tags Challenge. As I mentioned in the last post, I ran into a snag on Day 8 in trying to use product from each sponsor of the challenge. I did not have anything from Uniko Studio which appears to be a company from the UK. The best I could do is use the inspiring tag from Jane and create something similar with what I had. Day 9 went much easier. I have a selection of Avery Elle stamps and dies and I particularly love the moose that Tracey used in her tag. Stamp set and dies from Avery Elle. Patterned paper from Reminisce. 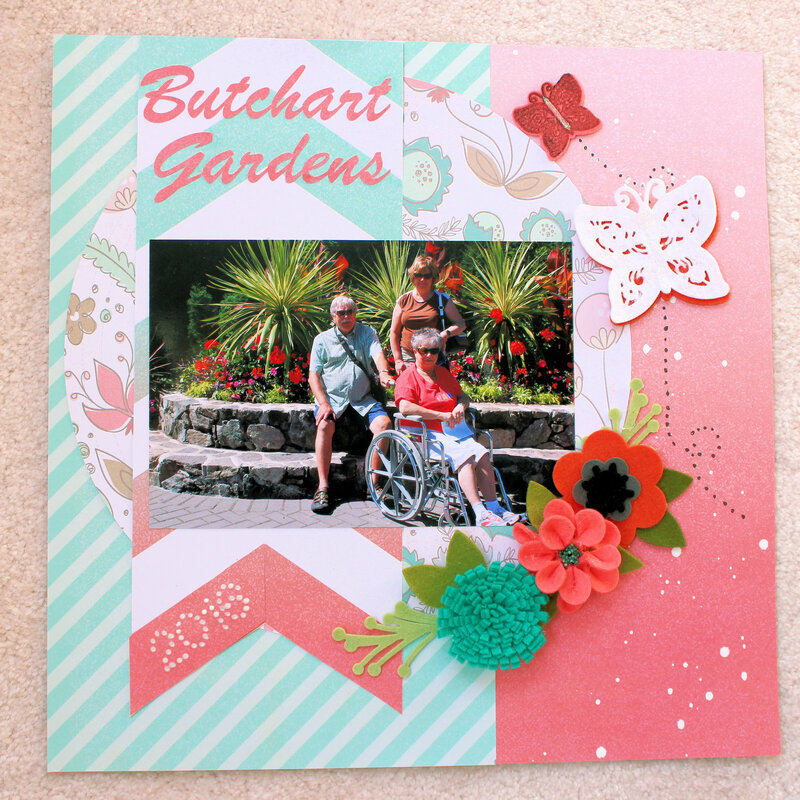 I had trouble again on Day 10 as I have no product from Sugar Pea Designs. I am happy to say there is a new die in the mail to me from Sugar Pea as we speak. In the meantime I drew inspiration from Lisa’s tag and made do with a similar stamp that I had. I thought this day would be fairly easy but my stash of Technique Tuesday product was decidedly un-Christmasy! Taking inspiration from Daniela’s tag with trees, I turned mine into a Christmas tree that lights up with help from a Technique Tuesday stamp set. This one was a bit of a strrrrrrrrrrrrrrrrrettttttttttttttttcccccccccchhhhhhhhhhh but I like the resulting tag. Stamp set is from Technique Tuesday. Patterned paper from Lawn Fawn and the dies from Papertrey Ink. Do you get it …………..bears and forest go together like the things in my tag: Turns out I love this tag and if I have a spare two hours, I will recreate it. Stamp sets are Lil Inker and High Hopes Rubber Stamps, Die is from Wplus9. Christmas word is from Clearly Besotted. Santa’s hat die came off the Ark I think….Stampin Up 1995. 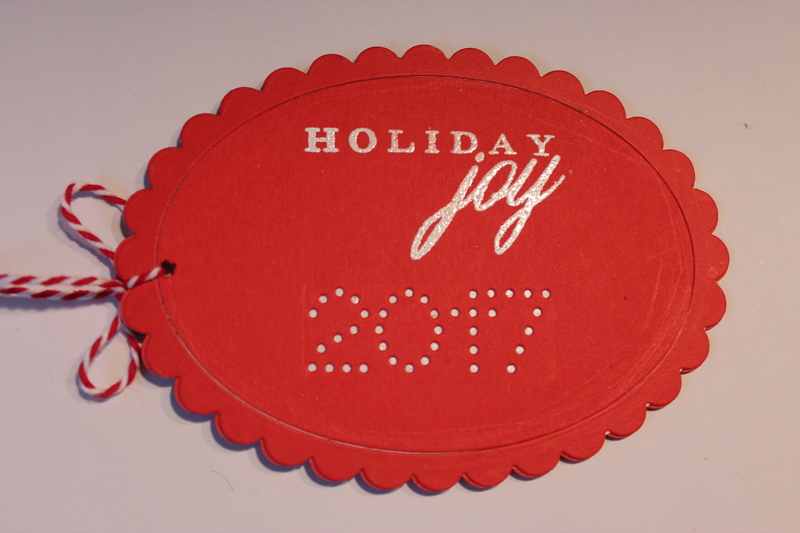 Somewhere in my morning ritual of following a number of crafting people, I came across someone who mentioned that they were going to also enter their tag into the 25 Days of Christmas Tags 2016 Challenge. This intrigued me as I wanted to make a number of Christmas tags this year. Following the link, I ended up on the blog of Tracey McNeely, named In my Creative Opinion. It appears to be a Canadian Blog, so I was even more interested. The problem is that the challenge started on November 1 and it was now November 21st! That meant a lot of catching up to do. I always feel a need to justify my huge stash, by making a concentrated effort to actually use everything I have bought. It occurred to me that I could add to this challenge by challenging myself to make a tag using products from each of the 25 sponsors of the challenge. So far, I have managed to do this, but there is a problem looming on Day 8. The rules of the challenge include citing the source of the tag inspiration from the tags done by each sponsor’s design team. My tag is from Casual Fri-dies. Snowflake Simon Says Stamp and Sleigh image from Heartfelt Creations. Merry Christmas die is Simon Says Stamp. Tag is from Ranger, Star die and embossing powder is from Recollections. Birch trees die is from Simon Says Stamp as is the woodgrain cardstock. The dear is from Impression Obsession. Ribbon is from Recollections. Decorations on the ornaments is from Winnie and Walter. Ornament bases are from Papertrey Ink and the patterned paper is from Reminisce. Background is from Reverse Confetti. Season’s Greetings die is from Simon Says stamp. Sequins are from Pretty Pink Posh and Craft Medley. Tag is from Elizabeth Crafts. Brown woodgrain cardstock and Totally/Fabulous dies are from Ellen Hutson. Patterned paper from Photoplay. Santa and Sleigh are from Papertrey Ink. 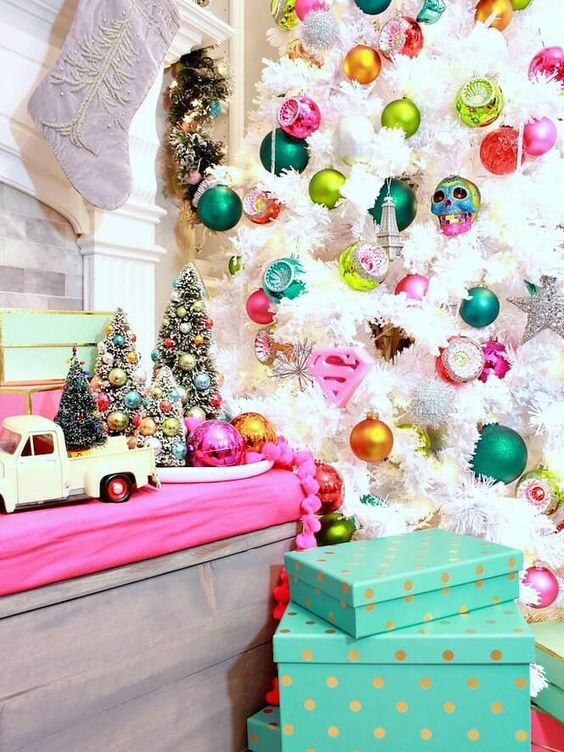 The blog hop is on November 25th but Papertrey Ink has already posted the Inspiration Photo so I could get started on it. Wasn’t that nice of them to do that specially for me! LOL. 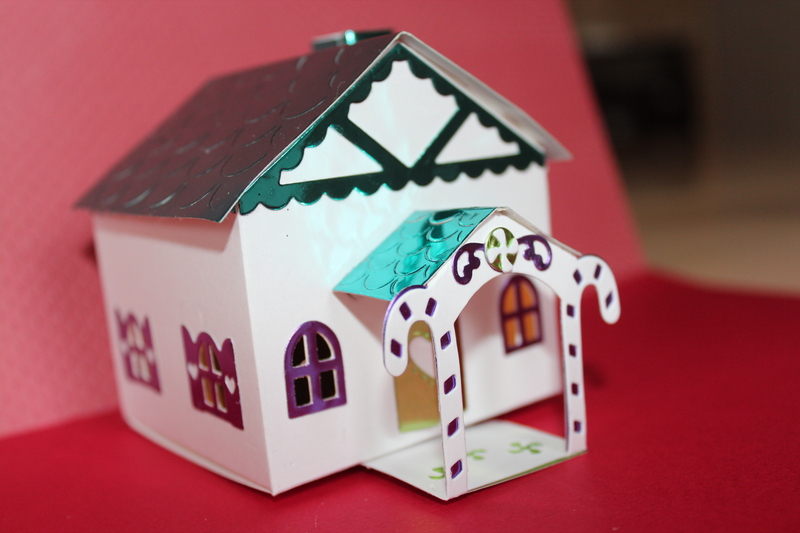 I decided to use the colours as the inspiration and break out my new Tiny Town Gingerbread House from Papertrey Ink. I had been talking with Sandra about how popular things that light up are these days, so my goal was also to have this light up. Of course, that changes the engineering of the basic box to accommodate this and that means added time. This is a project that looks much better in real life than it does in these photos. I was in a hurry and didn’t use a tripod and it is a dull gray snowy day so the lighting is poor. The accents are in foiled cardstock which never seems to translate well in photos either. 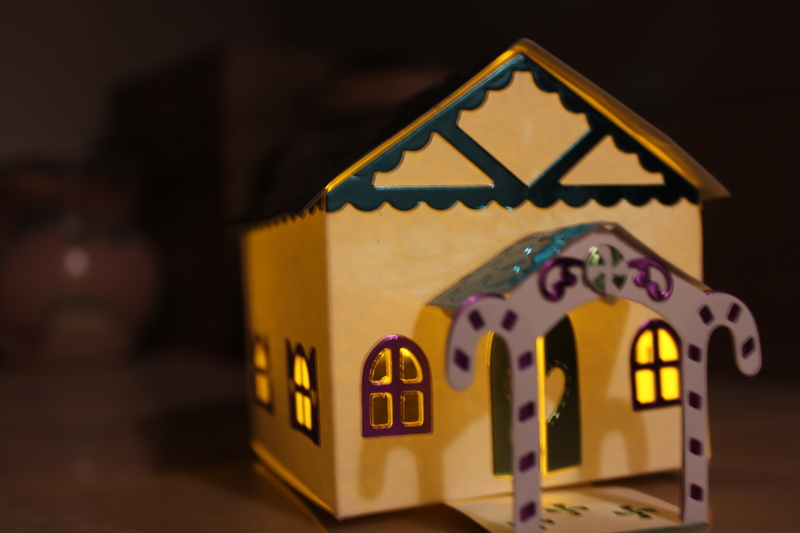 Oh well, I am hoping for a vast improvement in both the photography and the project by the blog hop on the 25th.